CWA’s annual Global Summit continues to send ripples spreading from CWA to the United Arab Emirates, United Kingdom, China, Korea, Colombia, Poland, Germany, Lithuania and beyond. The 10-day human rights and social justice program is based on genocide prevention. The program welcomes high school students and teachers from throughout the globe to our campus and into the homes of CWA families with students in eighth, ninth, 11th, and 12th grades. During the Summit, speakers, field trips, and discussions focus on moving participants from an “us versus the other” mode of thinking to one that values connections, the worth and dignity of all people, universal human needs and rights, and the ways each of us can make meaningful and concrete differences in the lives of people who formerly were “others.” This is usually done through simple everyday actions such as by reaching out to understand and include them, and by being an upstander rather than a bystander. After the Summit, delegations take their new ideas and skills into their own communities and start more ripples of social justice through their everyday decisions and special projects. As CWA families host Summit participants, opportunities for meaningful connections multiply and “dinner table diplomacy” is frequent, informal, personal, powerful, fun, and often long lasting. Many CWA alumni report that relationships with the students they hosted grow over the years, and many alumni have chosen international relations or related majors and careers, influenced by their Summit experiences and the cultural competency skills learned through CWA’s classrooms and programs. Summit speakers have included Carl Wilkens, the only American to have stayed in Rwanda during the 1994 genocide and credited with saving hundreds of lives; holocaust survivor George Elbaum who, because of his Summit-forged connections, finally returned to visit Poland; and Theo Chocolate, a local fair trade bean-to-bar chocolate company. We have partnered with World Bicycle Relief (which inspired a new Theo Chocolate bar, and a trip with CWA math teacher Gil LeFrancois and students to Zambia to deliver bicycles and chocolate bars); Olympia-based Alaffia, a company that makes personal care products to support women in Togo; Kiva, with whom students fund micro-loans to entrepreneurs worldwide; and non-profits PATH and Splash. The delegations also visit the Bill and Melinda Gates Foundation’s Discovery Center. 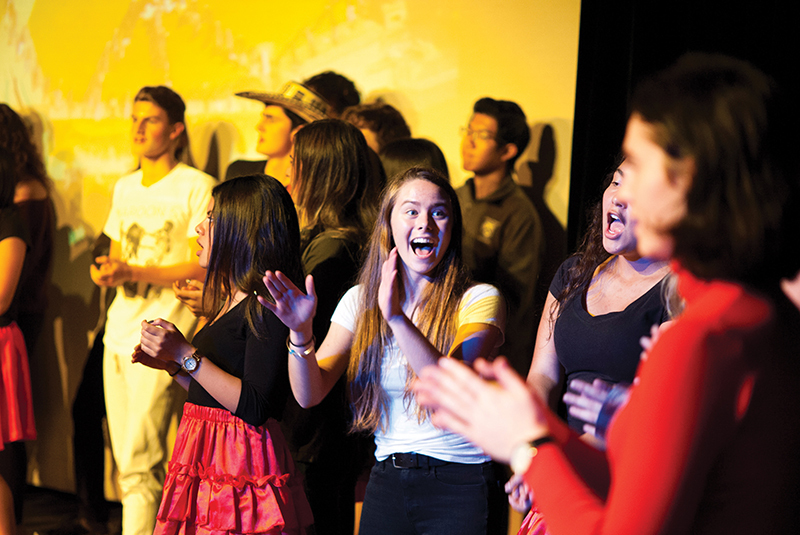 The Summit includes powerful theme-based projects lead by art teacher Christina Bertucchi and music teacher Rafe Wadleigh, and culminates with an assembly. The Global Summit has become an integral part of CWA, and quite literally put us “on the map.” A number of Winterim trips abroad have been possible due to the close relationships CWA faculty and families have nurtured with the Global Summit schools. The idea for Global Summit started when former Upper School history teacher and retired Army officer Nick Coddington attended a Holocaust education workshop at Columbia University, where Coddington is currently a doctoral student, and met teacher Marcin Pasnikowski from Swidnik, Poland. After the fall of the Iron Curtain in 1989, Poland found itself increasingly turning to “the West,” so the Polish school created a program for students in Western Europe. In the spring of 2007, CWA students and teachers joined to represent the United States, and Polish students visited CWA for its first Global Summit that autumn—an exchange that continues. “Global Summit is a life-changing and mind-opening experience,” Pasnikowski says. “For Polish students, the speakers at the Summit talk about issues they’ve never heard about and raise awareness of important global challenges.” Often, after learning about issues and realizing the power they have to make changes in the world, students act. For example, after learning about micro-lending, Polish students organized a bake sale to support entrepreneurs in other parts of the world. Colombian, Emirati, and Chinese students, too, have initiated projects after the Summit. Students typically go quickly from anxious strangers to close friends. In fact, on the Sunday morning when students leave, tears flow and CWA students block the school bus that takes the delegations to the airport. Throughout the years, my children, Andrew (’12) and Grace (’18) Palmer, have hosted many Summit students. In 2009, we hosted Hamdan Al-Yousefi from Abu Dhabi, and at the end of the Summit, Hamdan wrote a letter to CWA on behalf of his peers about their homestays: “Simply put, they don’t break down barriers, they annihilate them. As such, stereotypes are rethought. Experiential Learning with Middle School Days!